Simon Says Stamp Mother’s Day Card! Hey everyone! Good morning! 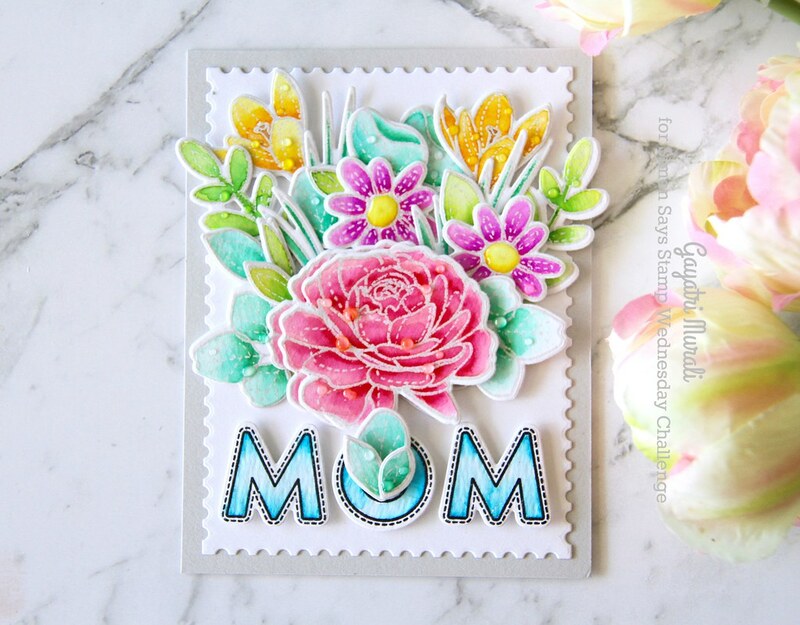 I have a mother’s day card using new stamp sets and dies from Simon Says Stamp Mothers Fathers and Florals and New Beginning releases. These new goodies have been sitting on my desk for past two weeks. I finally had the time to ink them up yesterday instead of cleaning up my craft desk. This happens to me always. Get distracted and start making cards. I still need to clear the desk. How about you? Do you get distracted while cleaning and do something totally different? Let me know. 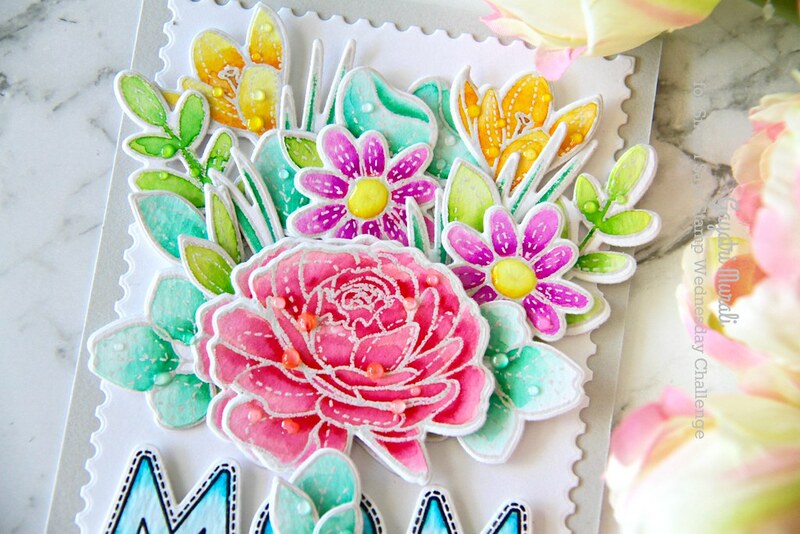 Anyway, I watercoloured the images from More Spring Flowers stamp set, die cut them to assemble and make a pretty flower bouquet on the card. I wanted the images not to have stark white outline but have a subtle colour. I used MISTI to stamp the images in Simon Says Stamp Fog ink, followed by versamark to clear heat emboss. Then I used Zig clean brush pens to colour the images and die cut them with coordinating dies. But the sentiment from Moms and Dads Icon stamp set is stamped in Versafine Onyx black ink and clear embossed so the sentiment pops. I coloured the sentiment with Zig clean brush markers as well. The cardstock I used for the flower cluster and the sentiment is Bristol Smooth. The white panel is die cut using the largest of the Simon Says Stamp Postage Stamp Edge Frame die set. The card base is Fog card base which coordinates with the embossed flower cluster. I added some Nuvo crystal drops in Morning Dew to add dew on the flower cluster. Love the pop of colours with the neutral background. All the products I used to make this card are listed below. When I first saw this I smiled – your color choices are perfect and I feel happy looking at it. Beautiful flower card Gayatri. Love the white heat embossing! Such pretty colors. You always make beautiful cards.